We can provide with the complete indigenous package for your next event. Product launches, Branch openings, conferences, exhibition & trade shows, outdoor events and family days, government events ( we specialize in NAIDOC events). We provide services throughout Australia. We ensure all cultural protocols are followed. No event to small or too big. When you want your Indigenous event organized…go to the no 1 Indigenous events company! Proudly owned and run by Indigenous Australians. To enquire about our Event Management Services please fill out the Enquiry Form or Contact Us for an obligation-free quote. Koori Kulcha prides itself on providing quality services every time. Every catering package is uniquely ours, discover culinary treats. Treats 60,000 years in the making. Don’t just order CATERING!! Order an EXPERIENCE!! Koori Kulcha were delightful to work with! Marie and her team were fantastic in ensuring that we had the best variety of options for our 3 day forum in Wollongong. They offered a friendly and professional service with the most delicious food. We would definitely recommended the Koori Kulcha team again. 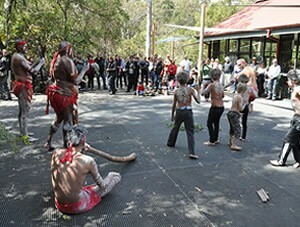 Koori Kulcha arranged a Welcome to Country ceremony at the Grand Opening of our new Distribution Centre in Adelaide. The feedback from our guests was all positive both for the performance (especially the Didge player who was brilliant and engaging) and in the respect and recognition for Traditional owners. I would not hesitate to recommend Koori Kulcha to organise indigenous performers for future corporate events. Koori Kulcha facilitated Catholic Care Wollongong’s 2014 staff development day. We couldn’t have asked for a more awesome, truly moving experience and were so grateful for the participation of the elders, community representatives and young people at a time which was difficult for local communities. 100 of our staff attended and the feedback from the day has been tremendously positive. A senior manager commented about gaining more from the day than had ever achieved through their own reading, their completion of on on-line cultural competency module and their own range of experiences. Thank you Koori Kulcha and we look forward to working with you again in the future. We were very excited about having Koori Kulcha visit and we couldn’t have asked for a better experience for the children. The children sat mesmerized by Pete when he told stories, showed artifacts. When he played the didgeridoo, their little faces lit up. It was a definite highlight for them. Deloitte Sydney were proud to share and enjoy a beautiful Indigenous lunch prepared by Marie and her team. Everyone loved her great sense of humour and the rare opportunitiy to use emu eggs to make our unique NAIDOC-themed scrambled eggs. Additionally, everyone learned about sustainable hunting methods and traditional customs which Indigenous people have used to live off the land for over 60,000 years and can still be observed today. We would highly recommend the team to anyone who loves delicious food and would like to learn how to incorporate Indigenous flavours into everyday cooking! I discovered Koori Kulcha Experience on my holiday trip to Australia. I participated on the “Indigenous Cross-Cultural Training” workshop. The Indigenous history time line, and the communication experience was amazing . The Food was D E L I C I O U S – MUST !!! Thank you for the great traditional experience Koori Kulcha. A truly amazing traditional experience !!! Pete and Marie have a way with the children that draw their interest right from the start We are looking forward to continued visits and learning more about the Aboriginal culture. We had an amazing day in Bowral with Marie & her crew!! Looking forward to coming up to the Café!